For Samurai Sword Soul’s tenth anniversary celebration, the creative minds behind the sword-fighting, comedic-acting troupe pulled out all the stops. Utsuyo Kakuryo: Passing by the Other Shore is an original theater production that blends traditional Japanese and contemporary elements. 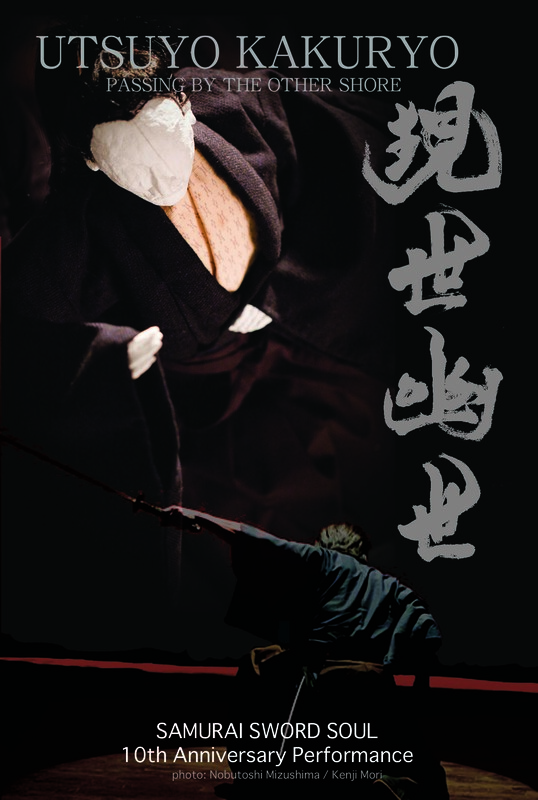 Adding video production, contemporary dance, and Bunraku-style puppetry brings depth to the performance, allowing Samurai Sword Soul to reach a higher level. The multimedia show enters its final weekend at HERE, where the ensemble received subsidized space, equipment, and technical support through HERE’s curated rental program. Utsuyo Kakuryo begins in Kakuryo, the “other” world where lost souls wander aimlessly in what appears to be a never-ending Butoh dance of timeless agony. 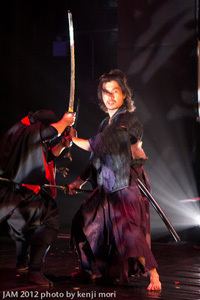 Going back and forth with Utsuyo, which is the world of the living, the play follows the story of Izou (played by Samurai Sword Soul co-founder Yoshi Amao), a master swordsman who started a revolution in Japan, and his conflict with Sugimaru (played by the other Samurai Sword Soul co-founder, Yoshihisa Kuwayama), a brash son of a powerful ninja clan leader. With the exception of a reference to McDonald’s, the play is set in the Sengoku period, an era in Japan that was defined by wars during the mid-16th century to the beginning of the 17th century. The underlining themes deal with duty, honor, and familial responsibility, values that are still deeply ingrained in Japanese society today. Izou struggles with these values during his brief stop in the mystical “other” world, asking himself, “Can I really change this country, or am I just a killer?” While in Kakuryo, Izou and other souls like him can achieve realization and return to the “real” world. 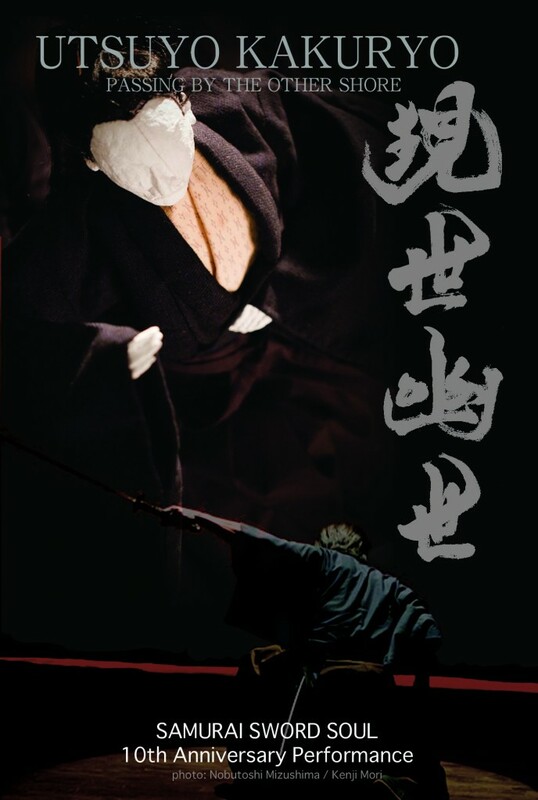 The sword-fighting scenes are action-packed and entertaining, but the Bunraku puppetry gives us a glimpse into traditional Japanese theater. The real star of the show is musician Seiichiro Koizumi, who performed live music on traditional Japanese instruments such as shamisen and bamboo flute, giving each scene texture and a cinematic feel. Utsuyo Kakuyo: Passing by the Other Shore is performed in English and Japanese with English supertitles. Samurai Sword Soul has set up a Kickstarter campaign to raise funds for the production of Utsuyo Kakuryo. Click here to donate. Click here to purchase tickets to one of the remaining shows. Click here to see amazing production photos by Brian Krontz on Oberon’s Grove.